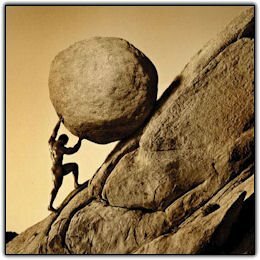 Sisyphus – the story of my life. Once again, I am inspired by The ArtOrder’s latest portfolio-building exercise and what I’ve learned lately about my work, my regrets, and my future as an artist. All of my art supplies are in boxes right now and I am here sitting on the verge of a big change in my life. I’m moving to a new area with my significant other as well as taking the first steps to realizing a strategy I have been ruminating on to re-invent my art and myself. All of this pondering on who I am and where I’m going has me realizing that there is little divide between who I want to be as an artist and what I want to be doing as a career. I’ve looked back on my own work and realized that I’ve only started painting the things I want to paint in this past year. I’ve made due in the past by trying to fit my art into a box (the fine art box, the licensing box, etc. etc.) just so I can be doing art and making money, ANY kind of money, so I could call myself ‘successful’ at this livelihood as long as I’m doing something creative. My approach to being successful has been completely backwards. I’ve been struggling in my career as an artist, unable to find a focus that I felt fit me 100% or to achieve the kind of monetary success I want. It’s taken experimentation, a good deal of floundering with jobs I grew bored with, and a great sense of failure that I’ve had to overcome to get to this point. I’ve struggled with the advice from others that “Not every job is going to be interesting so you need to compromise to pay the bills”. This is true to an extent, but I realize now that if I’m bored with my work 90% of the time, there are far easier ways to be bored (and get paid better) than stagnating in a field of art that is more destructive to my drive in life than useful. Getting to know myself better as well as asking myself some tough questions in the Painting Drama class and the ArtOrder’s portfolio-building series have really peeled away a film of indecisiveness that I have been blinded with for a long time. It’s no coincidence to me that both of these places didn’t jump right into ‘what are your technical skills like’ at the beginning of the program. Instead, the very first thing you do in both is to ask intensely internal questions. Who are you? What are you passionate about? Where might your passions fit in to the art industry? It’s no wonder Jon calls this exercise “The Insanity Loop” where we do the same thing the same way and get the same results. How many times have I written in this journal that I’ve formulated a strategy to enter a particular field of art, only to find what I am trying to do wasn’t right for me after all and then I am sent right back to square one where I’m not getting any of the kind of work I want? The answer for me has been a simple one. I am not presenting the kind of art I want to be doing, rather I’m maintaining a status quo of doing the work that keeps my head above water. True, we all have to pay bills, but again, I’ve reached this breaking point where I realize I could be working at a different profession and make more than I’m making now with art. The pure act of creating is not enough to maintain my happiness and well-being in life. The mental strain of not being successful at what I’m doing with my art or actually painting the kind of work I want to paint has made me realize that it’s make or break time. I need to aim higher than I am and figure out a better strategy than ‘do art and they will come’. I needed specific strategic planning and that is what I am finally doing by asking the tough questions I wasn’t asking before, or accepting the answers that I was afraid to act on for lack of my own confidence. Apparently it’s been a rather cathartic couple of months for me! I finally feel I’m on the right path in my career. I’ve got a strategy to paint the types of things I have always wanted to paint and I am far more confident that this simple baby step forward will help advance my career in ways that mere blind enthusiasm hasn’t in the past. It’s taken this turning of a harsh lens inward to realize what I’ve been doing wrong. I hope this rambling has proven useful to someone else out there who might be trying to figure themselves and their goal out. A lot of us start out with such a broad expectation of ‘I’m going to draw and get paid for it!’ but then let our experimental nature and broad artistic interests distract us from applying a pointed strategic approach to anything. Another important lesson I have learned recently is that there is a difference between an interest and a passion. A passion is what my career will be. An interest is where I will spend my time having fun without the worry of judgements or money. Jon’s portfolio-building series has been one strategizing method which has worked for me. Maybe it will work for you too? I’d love to hear your thoughts and feelings in comments, if you’ve taken on this exercise for yourself. Share with me! I don’t want to be the only one rambling here. I’m feeling hyped after my last assignment where I formulated a strategy to take on the mighty portfolio beast. But like anyone at the mouth of the dragon’s cave, I’m acknowledging a few of the fears that have kept me from realizing my action plans in the past. Fortunately for me, that’s exactly what this week’s homework is all about! • Look back over your strategy and plan and see in which ways you can improve them, and use them to set you up for success. • Look at the roadblocks that you have put in your way in the past, or are currently putting in your way, and share them with the community so that we can all learn from them. I realize after looking at my portfolio action plan that the dates I set were a bit hazy, as far as providing me with specific goals to focus on. So I chose to break each image down to two dates, one for the sketch draft deadline and the second for the final draft. This way I have until the sketch deadline to get all my ideation, thumbnailing, and studies done for each piece. Then I have until the final deadline to refine till my heart’s content. I find breaking the plan into time phases like this keeps me from dwelling too long in the idea and research part, which is a really bad habit of mine. I tend to get very caught up in having the perfect idea before I ever put pencil to paper. I’m also debating adding more paintings to the list. I thought better of it, however, because I notice one of my bad habits is to overload myself with projects until I get overwhelmed and just give up on them, especially before a big event. More than once I’ve stressed myself out before big selling events like DragonCon by trying to go above and beyond for my gallery, which turned into many frustrated nights of staying up late to meet the incredibly unrealistic goals I set for myself. Some mentioned in my improvements above, but here’s a quick rundown of my most common roadblocks. Let’s face it, guys. I’ve made portfolio lists in the past here in my journal and haven’t exactly realized all of them. Apparently I am my own worst enemy, as most artists are! Overloading myself with projects and artistic distractions. Being unable to keep focus due to outside forces, like deadlines for my other job, distracting people, unorganized creative work area, etc. Feeling overwhelmed and rushed by the fact that I am practically starting over for this portfolio. None of my past work fits and I feel like I am back at square one with my body of work and that nothing will be good enough from this point on. Worse, I simply don’t have enough time to catch up with the rest of the industry and younger artists who are already ahead of me! Feeling too intimidated by technical aspects to feel confident about painting the pieces. For example, the idea of doing a piece with multiple figures is intimidating because I don’t do them often and I can’t afford to pay models to pose for me so I can draw them as accurately as possible. I’m hopeful that now that I’ve sat down and put a face to my fears that they become less scary. All that’s left now is ACTION! I am ready for this dragon, baby! The last assignment was a tough one where I dealt with my ‘self-assessment’ and realized half of what I currently have in my portfolio is not even in my area of interest, personally or professionally. The next entry in the Portfolio Building series deals with formulating a strategy. Be sure to read Jon’s original post before reading my homework, else you’re only getting half the battle! • Identify your “worst Image”, and share what you learned from identifying the image with someone. I still love you, Kana! Using my portfolio that was mentioned in part 1, my worst image has to be Dragon Prince. It’s not bad, technically, but it also doesn’t really create any kind of narrative within the piece. My reasoning for including it the first time was part of a scattershot strategy to include RPG interior black and white images with illustration in a Single Portfolio to Rule Them All. (Note to self: bad strategy). I also noticed during both portfolio reviews that the reviewers passed over this image very quickly, as if they were bored by the sight of it. It also has nothing to do with my target market of book cover illustration. 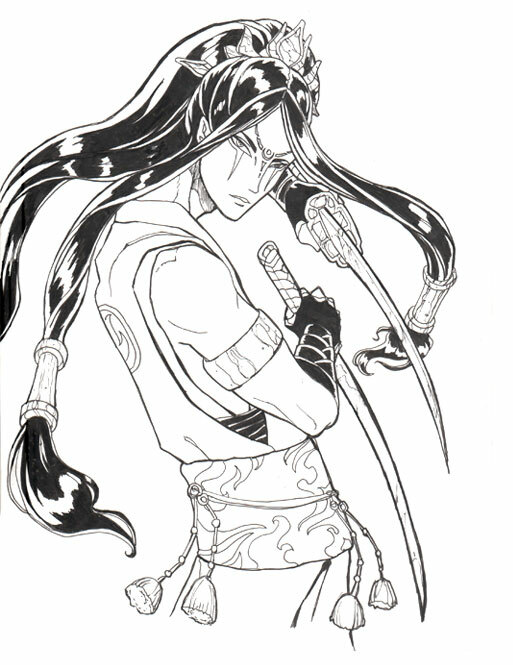 He is just kind of there…looking pretty with swords. Perhaps if he were interacting more thoughtfully with a target? Perhaps if he were placed in a more interesting setting to show some hint of his world to create some interest? What story is he trying to tell? (or fellow PD students, what is the About?) What questions are the viewer asking themselves about him? None, because he’s just there with swords with nothing to challenge him, visually or compositionally. Like many of my pieces in this portfolio, it is one central character who is not interacting with their environment or any other characters. I have a bad habit of being afraid to venture into images with grander scales of action and multiple figures. It is true some book covers have successful images with just one character, but there is always some element that draws us in, creates visual tension, and gets us asking “why”, like Jason Chan’s King of Thorns, for example. In fact, all of the covers for Lawrence’s trilogy achieve what I believe to be a pretty successful one-character set of simply AMAZING covers that make me want to read more. I chose Tor Books because many of the artists whose work I enjoy (Dan Dos Santos, Jason Chan, etc.) have worked for this company creating the kind of art I would like to be creating. Most of the work they produce that I enjoy tell the kinds of mature and mythical stories with subversive characters I would like to be painting more of. Specifically, I want to specialize in covers with characters, instead of the more abstract symbol covers. Easily readable compositions with areas blocked off for text, but that still feel ‘finished’ without the text. Semi-realistic style, which suits more dark and mature fantasy stories. You can view The Long Version for specific image briefs, deadlines, etc. I am narrowing my specific paintings to character-centric fantasy book covers. Starting with a realistic set of FOUR paintings, which gives me seven months starting in February till August, when I will be attending Illuxcon shortly after. That’s nearly two months per image, which should be plenty of time! 1. 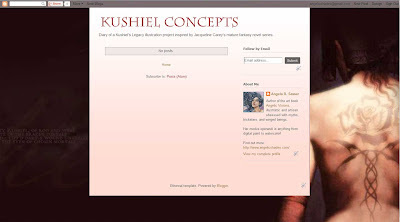 Kushiel’s Dart Cover – Creating my own rendition of the cover of one of my favorite fantasy novels. Covers meets my need for tattooed AND elegant ladies in a decadent mature fantasy setting. 2. Song of Exile (Ramah Cover) – A tentative cover from my own original fantasy story featuring Ramah, an exiled warrior prince. This would allow me to show a warrior from a desert setting for added portfolio variety. 3. 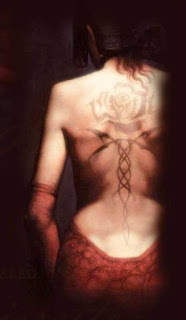 Song of Exile (Melakim Cover) – A tentative cover from the same setting as Ramah, except featuring my demon-hunting, vampire slaying tattooed Hunter, Melakim. She would fill my quota of capable female, gritty action scene, the challenge of multiple figures, AND swashbuckling figure. 4. Persephone Cover – To cover my need for mythic. I plan to revamp my old Persephone Queen of the Underworld painting with a more narrative spin. I didn’t learn anything new, rather, I learned more specifically what I’ve always known. I had never been quite sure what it was that I could be drawing that made an image not just a portrait, but a book cover, which fulfills very different needs than a character simply existing in space (which is what my current portfolio is riddled with). This exercise also got me thinking more specifically about what paintings I could put in my portfolio that aren’t just what I really enjoy drawing, but also which show that I am capable of a wider variety of subject matter beyond graceful tattooed winged women, which is what I am currently known for. I didn’t have a strategy for the book cover industry yet so this was exceedingly helpful and much more focused than my previous attempt at putting together a strategy for the art card CCG industry. So far, so good! The strategy is there, but can I bring it into reality??? I suppose we’ll find out! Continuing my portfolio building journey from TheArtOrder’s blog series. The last assignment asked me to think deeply about what my portfolio was currently comprised of. The next in the series is the self-assessment and asking the tough questions. Don’t forget to read Jon’s original post before reading my homework assignments here so that they make sense! Otherwise, you are only getting half the lesson. Question #1 What are you passionate about? Imaginative realism, high fantasy, alternate history, world mythology, folklore, subversive characters, art nouveau. Question #2 What do you want to bring forth in the world? 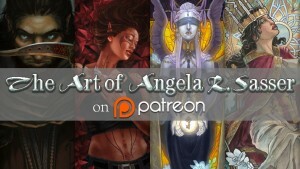 Paintings and stories about my favorite kinds of mythical and subversive figures. Question #3 Who do you want to be in your life? I want to be the type of person who is completely immersed in their passions because I firmly believe that if I am not living a life that does not fulfill my inspiration and passion for art that I am unfulfilled, emotionally. I need to create and I do not want this act of creation of art, writing, etc. to be a small part of my life. I want it to BE my life and that is the type of person I want to be. When I die, I want to be happy that I was true to myself and my drive to create. Question #4 Where do you derive your inspiration? Everywhere, culture, human nature, flora and fauna, movies, stories, video games, folklore. It is my job to make the connections between any and all things, no matter how mundane they might be. Questions #5 Who do you want to be for others? I want to be the person they turn to for tales of the imaginative, immersive, and elegant variety. Question #6 What is your favorite content/subject? The content I enjoy depicting the most range from roguish character types, characters who walk between the lines of morality, who charm us with their edge of mystery, to the mythic archetypes present in the subtle magic of folklore, particularly figures who visit the underworld and otherworldly realms. I also have an affinity for angelic and faerie figures who represent an otherworldly beauty and mystical presence. I am also fond of illustrations of characters at the passionate partings and meetings that drive their stories, usually tragic or romantic in nature. Question #7 What is your favorite medium? Color pencil is still my favorite even though I am trying to work more digitally. I also enjoy the mix of the luminous translucency of watercolor with the texture and precision of color pencil. Question #8 Who is your favorite painter/illustrator? It’s so hard to choose when there are so many illustrators I admire! If I have to choose just one, it would be John William Waterhouse because of his powerful storytelling, mastery of texture, and his whimsical mythic subject matter. He paints the subject matter I want to paint with the kind of mastery over texture and atmosphere I wish I had. Question #9 What is your favorite texture, piece of anatomy, basic shape, color to paint? I enjoy the textures of flowing satin cloth, graceful necks, and jewel tones. Question #10 What do you get out of painting? When I successfully create a painting that I feel gets a viewer interested in learning more about that character or story, I get a great sense of joy and accomplishment out of their need to know more. If they are an artist and want to create more art after viewing my paintings, I consider this the highest form of joy. Question #11 What are your strengths in creative thinking, drawing, painting, problems solving, color theory, composition, perspective, visual narrative, and design? My strengths lie in creating memorable color schemes and colorful characters. I am particularly strong in depicting character expressions and faces. I have a great love of diving into character personalities and discovering what makes them tick, which in turn feeds into my problem-solving, as far as painting these characters in a scene. Question #12 What are your weaknesses in creative thinking, drawing, painting, problems solving, color theory, composition, perspective, visual narrative, and design? My work lacks the quality of atmosphere and realistic lighting that would make it truly immersive. While my color choices are generally strong, I have a problem altering these colors to create various moods in my pieces. All my pieces generally read as the same ‘serene’ atmosphere, which leads to a lack of variety, overall. My compositional structure is usually static and uninteresting. I have trouble populating my backgrounds with interesting objects, architecture, and other things that would give them a truly narrative quality. Question #13 Pick one company or product that you want to work on. (We’ll come back to this, so chose wisely). Question #14 What specific skills are REQUIRED to acquire work with the company or product you identified in #13, and what levels of proficiency are required in those skills? The ability to create an image that would inspire a reader to want to learn more, and therefore buy the book, product, etc. One must be a master at composition for this enticement to work. Question #15 How do your skills align with the company or product you chose in #13? They don’t. The lack of immersion in my pieces really makes them too weak to carry a narrative or have the visual impact the book covers at Tor require. Question #16 What is the skill that needs to be a priority for development to attain your goal of working with the company or product chosen? Creating interesting and provocative narratives in my work. Question #17 What specific problem does your company or product need solved visually? They need to entice people to buy a book or product with just ONE image. Question #18 What design challenges need to be solved visually? Characters (and their situations) need to be clear and interesting. Colors need to be striking. Compositions need to allow for all of this action, while still having room for text which does not clutter the entire painting. Question #19 What issues of “user experience” need to be solved visually? Prospective readers of the Tor Books brand need to be able to instantly identify an interesting book from a sea of other books. They need to be instantly fascinated by the narrative of the cover and to have their desperation to learn more to be so bad that they must buy the book to find out the whole story. I don’t think I have any one image that asserts all of these skills. 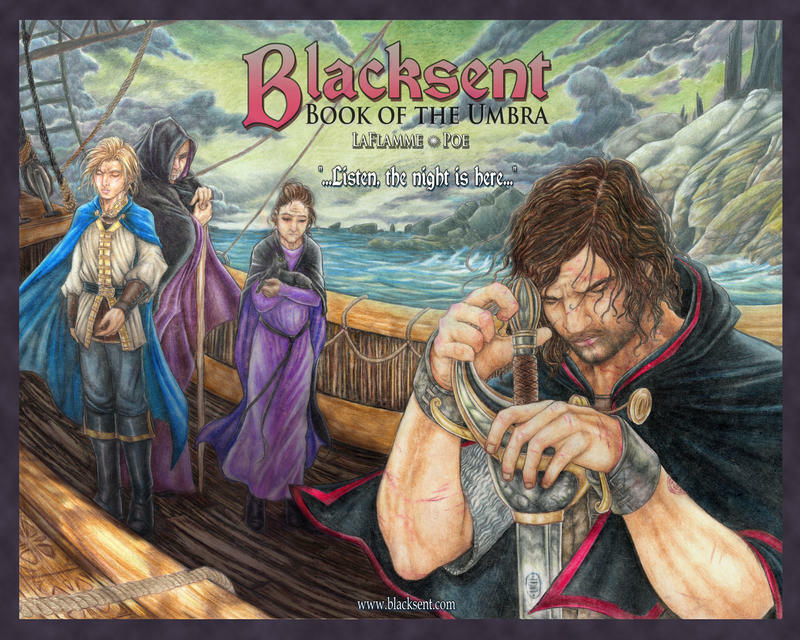 The closest one would be Blacksent: Book of the Umbra. It’s an old piece that’s not a part of my current portfolio and there are several things wrong with the anatomy, perspective, and atmospheric mood, but it’s the only piece in my body of work that gets the viewer asking ‘why?’. Why are those characters so distant and seemingly helpless? Why is the main character so distraught? A pity this piece is so dated now, or it would be in my portfolio. It was the first book cover I ever created. Just one. I need to do MORE work! Looking at my body of work, I hardly have anything that even lines up with what I list as my inspirations or even what I enjoy drawing. For as much as I am passionate about characters and storytelling, I have few pieces that depict the kinds of things I enjoy drawing OR want to get hired to draw.I think at some point I was trying to focus my career on drawing what other people wanted me to draw, pretty things that looked good on lunchboxes and journals so that I could get paid and still live as an artist. It hasn’t been until recent years that I’ve had time to analyze the various professions and realize that my passions and interests line up more firmly with book cover illustration and character design. My previous attempts to get into licensing only left me feeling bored and unfulfilled. I’ve already come to this revelation in the past, but this self-assessment only cements my dedication to this new direction! I remember back in college we had a class called Professional Practices where we were taught to take the best of our classwork and throw it all together in a portfolio to present to the world in hopes of getting work. For years, I presented my portfolio this way, meeting rejection every time. Little did I know, this strategy of throwing in everything is exactly what I wasn’t supposed to do. As an art director, Jon Schindehette teaches us in his blog series on portfolio building that a portfolio should be a unique statement made especially to speak to the one you’re presenting it to. It makes a simple sort of sense realizing that companies would want to see work they’d want to hire you for, rather than ‘that thing you painted that was pretty cool that has nothing to do with their brand’. Why it took me so long to realize this, I’ll never know. I’ve decided to write about my experiences with Jon’s portfolio building class series here in a little series of my own exploring my journey with his prompts. Note how many images are left in your portfolio, and share it with the rest of the readers. In the end, I’m left with only FIVE total pieces. Of these five, only three of them are even remotely in the area of book covers and art card work. The verdict? I need more work…and badly! And not only more in quantity, but more thematically in my areas of interest. Admittedly, I cheated leaving Lotus Dancer in since she was from my Fake Art Cards list, but I don’t find this list necessarily destructive, as it is specifically targeted to the art card market. We’ll see if the later exercises in this series convince me I was correct in letting her stay! I also disagree that no old pieces should go in a portfolio, especially if those pieces continue to show a relevant level of technical expertise and your area of pursuant interest. However, for the purposes of this exercise, anything that was over 3 years old was crossed out. So more than half my portfolio is shot! Onwards to discover what exactly I can do about this disturbing predicament!